Vickie Josal is a trainer for our therapy dog practice class. Vickie is a long time volunteer at the local shelter as a Lead Dog Walker, Transfer Greeter and an Animal Transporter. As a volunteer with KARE for several years, she assists with training classes, Doglish, event booths, transition consults and behavior modification. Vickie is always on the lookout for educational opportunities on canine behavior and how she can make a difference in their lives. To date, Vickie has graduated from the first Canine Behavior Internship Program and completed weekend seminars by Sue Sternburg and Kelly Bollen, in addition to many other webinars and local classes. She adopted a shelter pup, Daphne, and went through extensive training to become a Pet Partners therapy team. Positive reinforcement and reward-based training is her philosophy for both four- and two-legged students. 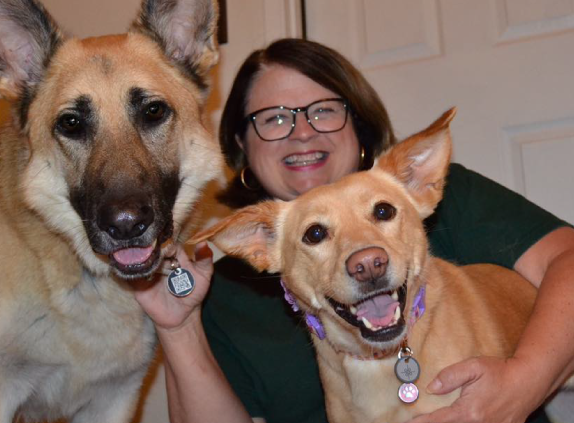 Vickie lives with her husband, Todd, and their two dogs, Lincoln, the GSD rescue, and Daphne, her shelter rescue, a lab/whippet/Australian Koolie mix. When Vickie is not doing “dog stuff” she enjoys spending time with her kids and grandkids, traveling and volunteering with the local charity haunted house as the volunteer coordinator.